Abstract A gradient method is recommended for samples that cannot be easily separated by isocratic methods because of their wide k range. In gradient elution the eluent strength is increased during the separation by changing the composition of the mobile phase. As a result, the analysis time is reduced and the quality of the separation is improved as well as the detection limit. Binary linear gradients are the most common and the easiest to handle. Although gradient elution is a more complex technique than isocratic elution, a good understanding is not difficult to attain. 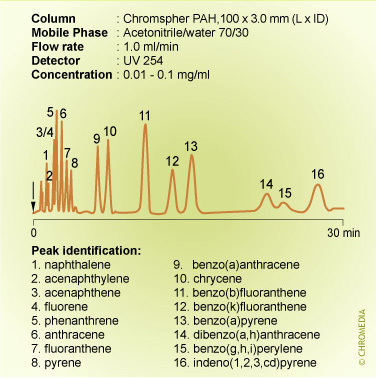 Complex samples containing many compounds with widely differing polarities will give complex chromatograms, where retentions will be widely and irregularly spaced. With isocratic methods, the overall analysis time can be unacceptably long. The nearly unretained components can merge together due to their short retention or they can simply stay hidden under the solvent peak. Determining the retention time is a problem and determining peak area is even more difficult. Strongly retained components show large peak broadening which smears peaks out and reduces peak height. 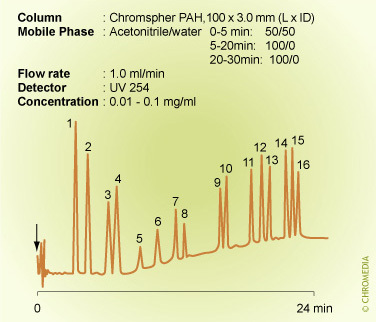 If broadening is particularly bad, the peak height can decrease to the point that the detector will not detect these components and one could wrongly conclude that such components are absent from the sample. In the event of widely varying component affinities for the stationary phase, we may need to change the composition of the eluent over the course of the analysis. This technique is called liquid-gradient elution and has the same effect as temperature-gradient elution in gas chromatography. Gradient methods can considerably improve the quality of the separation and the analysis time. Isocratic conditions are clearly unsuitable for the analysis of the sixteen PAHs listed as water priority pollutants: the figure above this text shows a poor resolution for the less retained solutes and small peak heights for the highly retained ones. In contrast, these problems disappear when using a gradient elution and furthermore, the analysis time is significantly decreased.